Many social networks allow users to check a wide range of statistics, including post engagement and follower count. Today a similar feature makes its way to Google+, in the form of Quick Insights. From your user profile on the Google+ site, you can click three dots on the top right (or on your profile background) and select 'Your influence.' This provides you with fairly basic statistics, including post and profile views, comments, +1s, shared posts, and more. Right now, data can take up to 48 hours to appear, and you can currently compare the last 7 or 30 days. My influence on G+. Needless to say, I don't use it much. 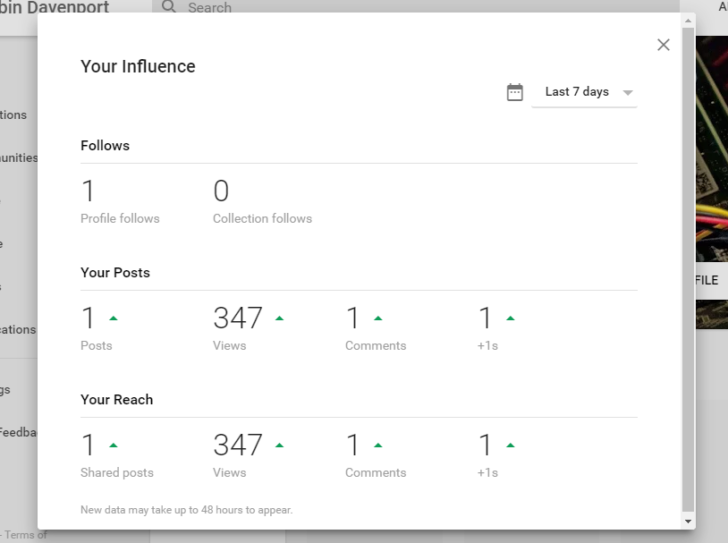 While it's nice that G+ finally has this feature, Twitter's analytics functionality is far more extensive. In addition, as of the time of writing, it is not available on the mobile apps.